The following statement was issued by the Mexican Mine and metalworkers union (Los Mineros) on October 19th. 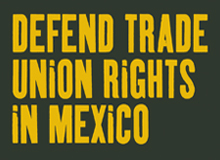 Employers in Mexico in league with the government are dismantling independent trade unions and imposing company run “yellow” unions on workers using illegal tactics, threats and intimidation. After a long and intense campaign of threats, intimidation and pressure carried out by Arneses y Acesorios de Mexico, a subsidiary of the Finnish company PKC in Ciudad Acuña, Coahuila, Mexico for almost three months, the company-backed CTM union was imposed in an election on Thursday 18 October 2012. The narrow margin of only 198 votes confirms the illegalities and irregularities committed in this election. The figures are indicative of the threats and pressures that both the company and the PKC-CTM directed against the workers of Arneses, and they are incriminating: 2,311 workers supported the National Union of Mineworkers, 2.509 in favor of the CTM, and 2,546 unused ballots, more than the winning vote. This entry was posted in Employment Rights, International Trade Unions, Labour Party, Media, Politics, Solidarity, Trade Unions, Trades Union Congress, Unite The Union, Workers Uniting. Bookmark the permalink.